Visit Fairbanks Alaska! At 65 degrees north latitude, the sky takes on a life of its own—a canvas for the aurora borealis, the midnight sun and sunsets and sunrises that last forever. Here you will find serious mountain ranges, pristine rivers and lakes, abundant wildlife and a solitude that is found nowhere else on earth. Locals embrace the natural world and have created a vibrant river city in the far north. 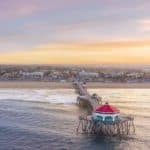 Where else can you travel to such a remote locale and still enjoy all the amenities of a charming downtown, a thriving arts community, rich Alaska Native culture, authentic Alaskan activities and attractions and endless opportunities for exploration? You can’t go wrong visiting Alaska anytime between May 10 and September 15. The days are long, nature is in full bloom, and the air is alive with energy. The best time to visit Fairbanks is from July to August. Shoulder seasons, including May to June and August through September, are also ideal. 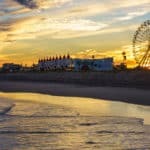 Although peak season brings the highest accommodation rates and the largest crowds of the year, it also welcomes the warmest weather, with average temperatures between 60 and 80 degrees. You can save money and still enjoy pleasant, cool weather in the late spring and early fall. 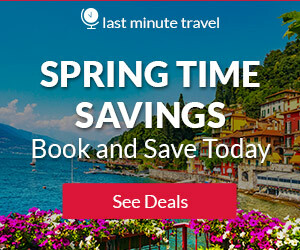 For the lowest rates, visit during the off season, which begins after Labor Day and runs through Memorial Day. If your main objective is to see the northern lights, the late fall and winter are peak viewing times. 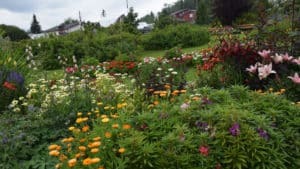 Fairbanks Alaska enjoys warm, sunny summer days. But as with any place in Alaska, the weather can be unpredictable. As a rule it is best to have layers available for the chance of a foggy morning or summer shower. Avoid any heavy winter gear, unless of course, you visit Fairbanks Alaska in the winter. A light wind and water repellent coat is also good to have on hand. The Morris Thompson Cultural and Visitors Center is a great first stop to pick up maps and information on things to do in Fairbanks. 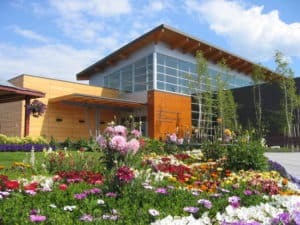 In addition to exhibits on the natural history of the region and the cultural history of Alaska natives, the center offers a free film on Alaska’s history and nature. What’s more, on the first Friday of every month, the center hosts a free reception featuring the work of an Alaskan artist from the interior region. This is also where you’ll find the city’s famous Antler Arch, a piece constructed with more than 100 moose and caribou antlers collected from all over interior Alaska. 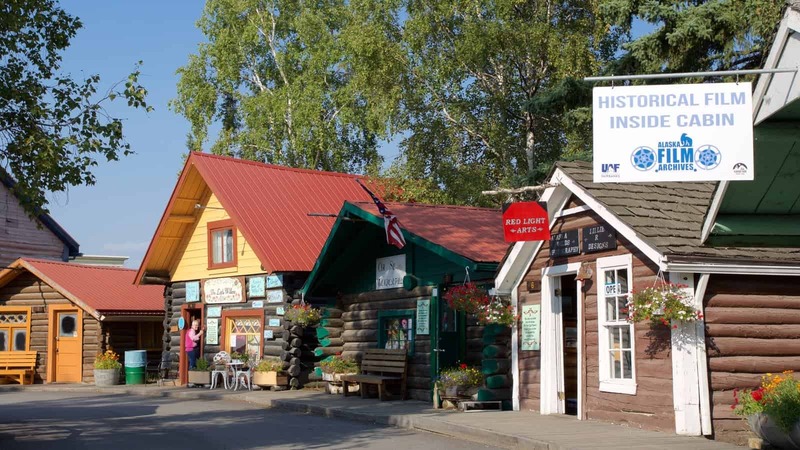 Part-theme park and part-historic park, the 44-acre Pioneer Park – built in honor of the 100th-anniversary celebration of Alaska’s purchase from Russia – showcases the history of Fairbanks through several museums, including the Tanana Valley Railroad Museum, the Alaska Native Museum and the Pioneer Museum. A replica steamboat and two historic houses also give a glimpse of life in past eras. The park features several restaurants and shops, as well as kid-friendly activities, including a train ride, mini-golf and a playground area. Although many attractions and concessions close during the winter, RV parking is available year-round. 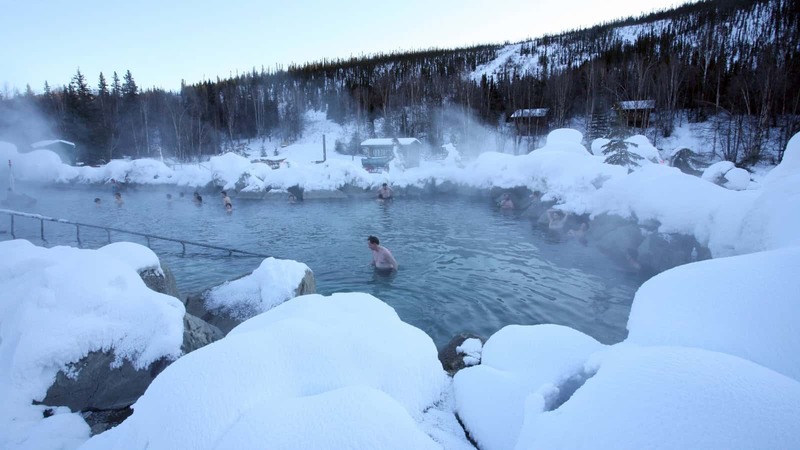 Chena Hot Springs is a world class hot springs renowned for its outstanding outdoor rock lake, year-round ice museum, excellent northern lights viewing opportunities and focus on renewable geothermal energy. In addition to the Hot Spring and the Ice Museum, Chena Hot Springs has a wide array of activities and attractions including dog mushing and kennel tours, skiing, snowmobiling, ATV rides, fishing, flight seeing, hiking, biking, aurora borealis viewing tours, horseback riding and even horse-drawn sleigh rides. Open year-round! Interactive and exciting dog sledding tours with real long distance mushers. Owned by Iditarod veteran, Jeff Deeter. Meet our friendly, genuine racing sled dogs. Beautiful scenery and warmer winter temperatures in the high hills above Fairbanks. Winter tours use a “tag sled” so you can try driving the dog sled! Summer tours use a 5-passenger buggy. 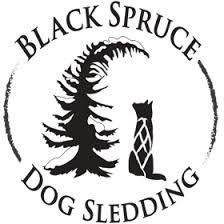 For more information call 907-371-3647, or visit them on the web at Black Spruce Dog Sledding. Friendly huskies year round! Night time Aurora viewing September – March. Day time dog sled rides November – March. Sirius Sled Dogs is located near the top of Murphy Dome about 25 miles northwest of Fairbanks. For more information call 907-687-6656, or visit them on the web at Sirius Sled Dogs & Aurora Tours. One and multiple day guided tours. Canoe-, Hiking-, Fishing trips; Tours to Denali, Artic Circle, Valdez, Chena Hot Springs, Angels Rock; Fairbanks City- and Highlight tours; Personal guided tours; ATV-trips; We are a family-owned business and speak German and English; All year round service for singles, families or groups; On all of our tours we offer beverages, snacks or meals; High quality equipment.Do you want to celebrate your special event like Birthday, Honeymoon, Anniversary at Arctic Circle? Denali? 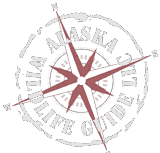 For more information call 907-712-4529, or visit them on the web at Alaska Wildlife Guide. They offer half-day guided ATV tours in Fairbanks. Tours depart Pioneer Park daily from Memorial Day thru Labor Day. Half-Day tours are twice a day, seven days a week and customers will drive over 30 miles off road. You may reserve a side by side ATV or a regular quad designed also for two people. The trail is fun and the scenery is fantastic! Your Alaskan guides will show you Alaska like you haven’t seen it before. Snacks and water are provided. For more information call 907-460-2320, or visit them on the web at Midnight Sun ATV Tours. Alaska Fishing and Raft Adventures offers first class year-round, summer and winter guided fishing and wilderness tours. We use rafts, dog teams and snowmobiles to access the goods of unspoiled country in Interior of Alaska. Our tours shin by choosing quality of experience and safety over any other aspects or prospects! Our summer float trips in Alaska (half/full day, and multi-day) are on the most pristine and scenic Alaskan wild rivers. These remote wilderness fishing float trips are any level fishermen’s, wildlife-viewing, and photography enthusiasts dreams come true. As you float, ride snowmobiles, or dog sled down one of Alaska’s most scenic and wild rivers or lakes, bald eagles, moose, beaver, grizzly or black bear, caribou, geese and other wildlife are part of the unforgettable fishing environment on your trip. Transportation, top of the line gear, and great fresh meals are provided. 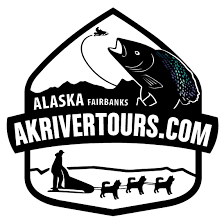 For more information call 1-800-819-0737, or visit them on the web at Alaska Fishing & Raft Adventures. The Pump House restaurant and bar is based on the reconstructed design of a 1890s workshop, complete with Victorian era pool tables. The interior is decorated with period oak and wood furnishings, with low beams and cozy decorations, while the restaurant itself looks out over the beautiful Chena River, providing stunning rooms in either summer or winter. For more information call 907-479-8452, or visit them on the web at The Pump House. Attached to the Pike’s Waterfront Lodge hotel, Pike’s Landing is a fine dining experience in Fairbanks. The restaurant hosts guests on its outside patio in the summer months, inviting them inside once moose hunting season kicks off and the winter weather drives people away from the elements. The restaurant is perhaps most famous for its Sunday brunch, the revolving menu of which features smoked seafood and cheeses, as well as luxury breakfast meats. For more information call 907-479-6500, or visit them on the web at Pike’s Landing. Chena’s Alaskan Grill offers great waterside views for diners at all times of the year. The outdoor patio is heated for the cool evenings in summer, and guests are invited indoors in the colder winter months. Main dishes include amber pork tenderloin, where succulent pork is glazed with apricot and pear chutney and served with brown rice and steamed vegetables. Other dishes include meatloaf, king crab cakes, and herb-grilled chicken breast, just some of the items from the mouth-watering selection of fish and meat dishes, both of which are served grilled or roasted. For more information call 907-474-3644, or visit them on the web at Chena’s Alaskan Grill. The menu is upscale without being fussy. Breakfast—which includes a hearty Alaskan buffet during the summer—features day-starters such as the house’s roasted corn beef hash, or sweet cream pancakes with blueberries. For lunch, you can’t miss with the hand-rolled slow roast pork taquitos or the teriyaki Alaskan salmon. At dinner, don’t miss the chance to start with a local favorite, the artichoke melt, paired with a glass of wine. Aside from the expertly-cooked steaks, dinner specialties include blackened Alaska cold water cod, curry chicken with lime chili glaze and Thai beef salad. For more information call 907-479-3650, or visit them on the web at Zach’s Restaurant. asual, fun and happening, this bar and restaurant inside the Fairbanks Princess Lodge is a great spot to grab a late-afternoon drink and appetizer or to settle in for a full meal. With a huge deck overlooking the Chena River and a trail down to the water’s edge, locals arrive for happy hour via boats—canoes, kayaks, or skiffs. A full bar, featuring Alaska Distillery spirits and Alaskan beers, complements a menu of quality pub fare and Alaskan favorites, like fish and chips or smoked salmon chowder. For more information call 907-455-4477, or visit them on the web at Tracker’s Bar & Grill. Silver Gulch has a claim quite unlike any other, in that it is America’s most northern brewery. And, as guests have to travel so far to get there, it even comes with its very own restaurant. The brewery creates four regular beers, all of which can be enjoyed in bottle or drought form. Of course, trying all that beer is hungry work, which is why the traditionally decorated restaurant, serves nothing but hearty Alaskan fare. For more information call 907-452-2739, or visit them on the web at Silver Gulch. This place is huge and hosts events non-stop. It’s located in a giant airport hangar in the town of Ester, 7 miles outside of Fairbanks. They have lots of live music, and if a band isn’t scheduled they show art house and indie films. The food is a notch above standard bar fare, with good pizza and sandwiches and great appetizers, like calamari and fried halibut. If the weather’s nice, the music venue shifts to outdoors. For more information call 907-457-5666, or visit them on the web at Blue Loon. This is where the hippies hang. It’s small, little basement bar located just off college campus. There’s live music almost every night, including favorite local groups and bands on tour. It’s a typical hole, smelling of sweat, patchoulie oil, and cigarette smoke. But it packs them in, and the crowd gets down. There are usually a few good beers on tap and a decent bottled selection. There’s no food at the bar, but a hot dog shop above the bar. The crowd is eclectic with bongo players, hippies, lumberjacks and people coming out of the bush. For more information call 907-479-4646, or visit them on the web at Marlin. This place is famous throughout Alaska for it’s fun, quirky atmosphere. The walls are covered with strange clippings and news stories, and Yankee paraphernalia (the owner’s a die hard fan). And the marquis sign advertises free parking and anchovies for 99 cents a can—which are available in the attached liquor store. It’s the kind of welcoming, weird place Alaskans love. Plus, there’s great beer, with local and Alaskan beers on tap and a good bottled selection. It’s a casual place, with casual pub food—burgers and sandwiches, fish and chips, nachos. But they also have good cuts of meat and fresh Alaska seafood. There’s live music pretty regularly (open mic on Saturdays) and the bar can get hopping. For more information call 907-455-6665, or visit them on the web at Ivory Jack’s. For $5 you can buy a hunk of raw hamburger and grill it yourself at this funky, Alaskan hideout. You can’t beat the atmosphere at the Golden Eagle Saloon. It’s not in Fairbanks, but in the quirky, small Alaskan town of Ester. Local’s love the saloon, not only as a place to gather and escape the isolation of rural Alaska, but also for it’s selection of bottled beers, a big pool table and the dog friendly owners (you’re in mushing country). Huskies and hounds lounge on the porch and floor of the rustic bar, which is surrounded by large spruce trees. Inside, there’s the grill and pot-belly stove, hearkening back to the country store era. The food isn’t fancy, but it’s good and filling. For more information call 907-479-0809, or visit them on the web at Golden Eagle Saloon. 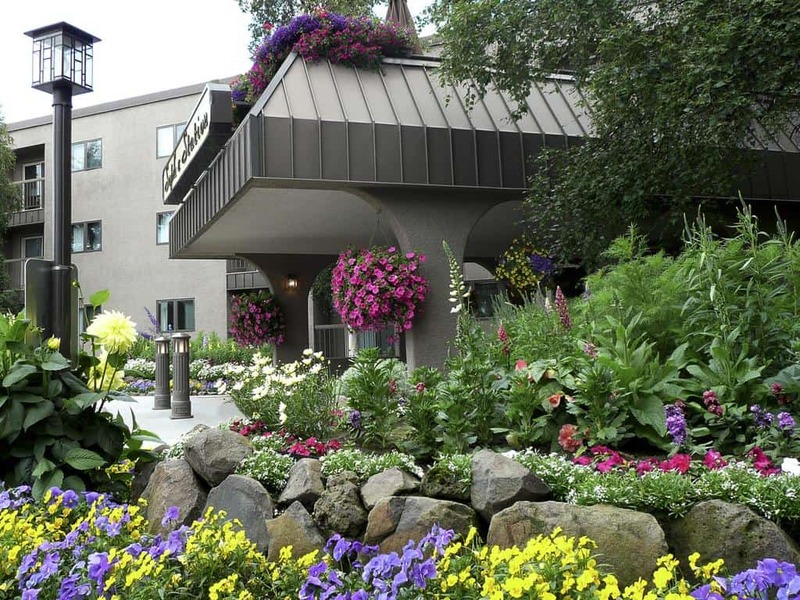 Offering lodging for both business and leisure travelers, Sophie Station Suites is truly a Fairbanks favorite. 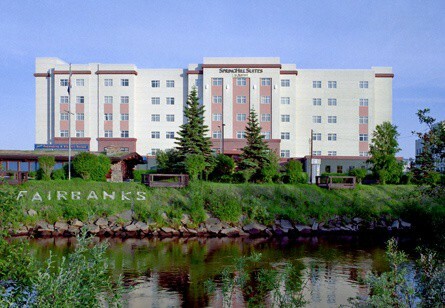 Locally owned and operated, our hotel captures the essence of the Fairbanks experience and provides guests with a level of personalized service, style and comfort unparalleled in the Golden Heart City. 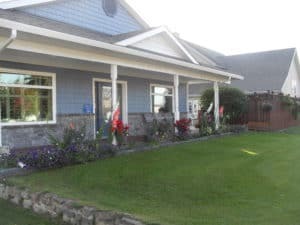 They are ideally located close to the University of Alaska Fairbanks and great shopping and offer quick complimentary shuttle service to Fairbanks International Airport and Alaska Railroad Depot for arriving and departing guests. Aside from their fabulous location, outstanding guest service is our best amenity. For more information, pricing, or to reserve your room, visit Sophie Station Hotel. 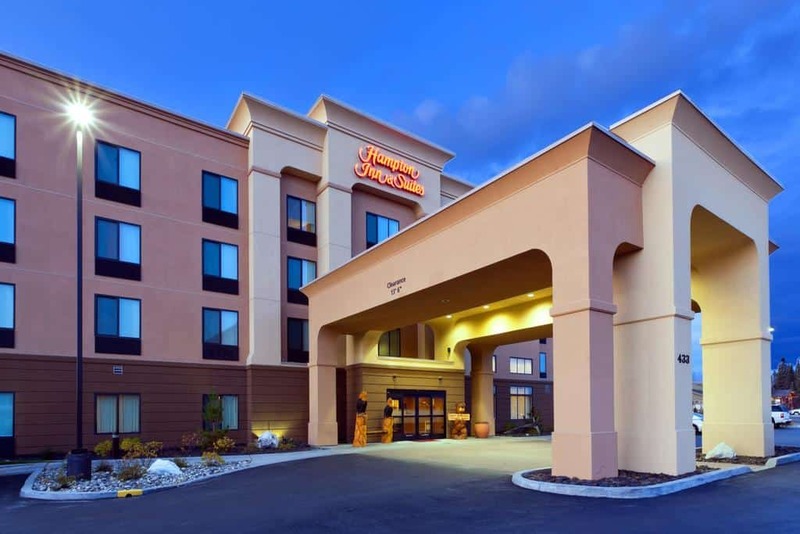 Located within 3 minutes’ walk from Central Fairbanks, Alaska and a 15-minute drive from Fairbanks International Airport, this seasonal inn features free WiFi. Rooms at Minnie Street Inn feature a cable TV and a work desk. Select rooms come with a microwave and a refrigerator. This Fairbanks property offers free trip planning. A lending library of books and games is available. A business center is also located on site, and guests have access to a full shared kitchen. For more information, pricing, or to reserve your room, visit Minnie Street Inn. 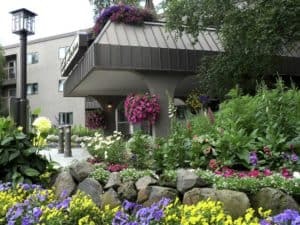 Tucked away on 105 acres surrounded by a 75-acre wildlife sanctuary and a 2,000-acre migratory waterfowl refuge, Wedgewood Resort is the ideal place to experience the natural beauty Fairbanks, Alaska has to offer. 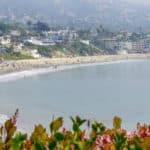 Enjoy the quiet, seclusion and breathtaking scenery along with the convenience of being minutes from downtown shopping, attractions and cultural events. Stay at Wedgewood Resort and you’ll be seemingly miles from anything, yet minutes to everything in Fairbanks! For more information, pricing, or to reserve your room, visit Wedgewood Resort. 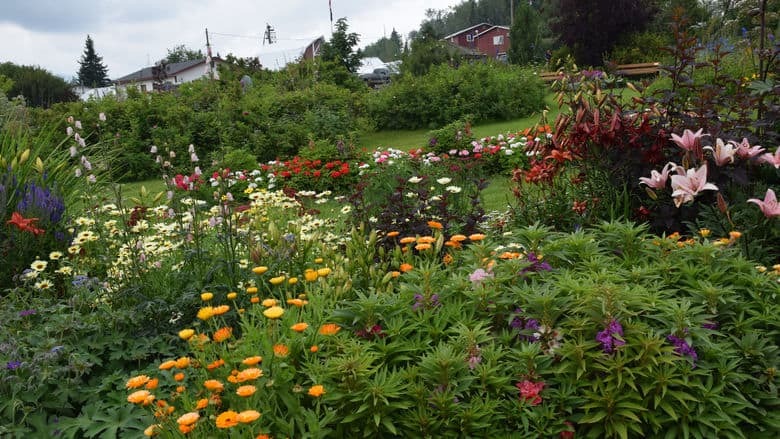 Located next to the Chena River, this hotel is close to Pioneer Park, University of Alaska Fairbanks and Morris Thompson Cultural & Visitors Center. You might even catch a glimpse of the Northern Lights during your visit. To complement your Alaskan adventures, they provide recently renovated suites to help you unwind in-between activities. Free Wi-Fi is available throughout their entire property to keep you connected 24/7. Join them for their free breakfast each morning of your stay and look forward to dinner at Lavelle’s Bistro, our on-site restaurant. For more information, pricing, or to reserve your room, visit Springhill Suites by Marriott Fairbanks. Make yourself at home in one of the 101 air-conditioned rooms featuring refrigerators and LCD televisions. Complimentary wired and wireless Internet access keeps you connected, and satellite programming provides entertainment. Private bathrooms with bathtubs or showers feature complimentary toiletries and hair dryers. Conveniences include desks and microwaves, as well as phones with free local calls. Enjoy a range of recreational amenities, including an indoor pool, a spa tub, and a 24-hour fitness center. A complimentary hot/cold buffet breakfast is included. 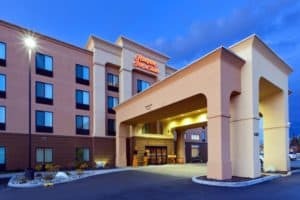 For more information, pricing, or to reserve your room, visit Hampton Inn & Suites. Its a great article, very detailed and informative. I have not traveled much in United States but Fairbanks now is definitely a location I want to visit. Great usage of different promotional mediums in this article. Overall, a very well set-up website, I am sure you are getting some good rankings. Thanks so much Nabeel, I am glad you enjoyed my visit Fairbanks Alaska post. It is one of those destinations that everyone needs to experience at least once in life. I have never been to the States. To be honest, I didn’t think that there were so many great places to visit there. The nature is so beautiful and I thought that what’s best in the US is the ig cities and the buildings. Your very post proves me wrong. Fairbanks looks like a place where I can spend several weeks or so. I adore hot springs and I this is the first thing that I visit when I go to a certain place (if any of course). Great Aspen! Alaska is all about wide open spaces and beautiful scenery. You will love it! Thanks for visiting beach travel destinations. This is such a thorough post on Fairbanks Alaska. I love learning and I picked up a ton of information and insights from the way you have delineated your post. I had no idea that Alaska was purchased from Russia – it has inspired me to learn more. I have always entertained the idea of visiting Alaska but didn’t really know what to expect in terms of where to visit and what kind of temperatures I would encounter. Your useful tips on the time periods to visit as well as the suggestions on what kind of gear to bring are most advantageous. I am really interested in the maze of the botanical gardens and I love that you will can find poems at the end of your journey of the maze. Is the name Dead Poets related to the film in any way? There seems like a lot of history contained in Fairbanks and the way you present it makes it look very enticing. I will add to my bucket list for sure! Thank you Leahrae, I look forward to delving in to more of your posts! I am so glad you enjoyed reading and learning about Fairbanks Alaska! No, no relation on the Dead Poets. I even looked it up to make sure I was correct 🙂 I guess having lived in Alaska, I did not think that most would not know that Alaska was purchased from the Russians, and was purchased for 7.2 million! Anyway, I hope you can visit Fairbanks Alaska soon! When you are ready, I would love to help you plan. I didn’t realize there is such a wide window for visiting without freezing. Thanks for this very informative article. We’ll now add this to our list of places we’d like to visit. Yes, but stay in that window unless you like the cold. I have been there when it was -70, and that is very very cold LOL. Thanks for stopping by. Wow that’s is so much great information here! My friend lived in Alaska for a long time and I always wanted to go there. I will definitely refer back to this site to help me choose my destination. Great Sarah, it really is an amazing place! Please let me know if you need any additional information. I really would love to eat in Chena’s Alaskan Grill. However I really wonder about something. Do they serve gluten free meals? You know Furkan, I do not know the answer to that. I guess simply because I do not follow a gluten free diet. I am sure there are lots of choices on their menu that are gluten free. It is a wonderful place though! Wow, Fairbanks Alaska is for sure a great place to think about if I ever want to go on a vacation. There are so many places to go. It would be a great summer vacation, especially to go camping and fishing in the Chena River State Recreation Area, it looks very nice. Will start planning and saving up for my vacation:) Thanks for the helpful information and awesome images. I’m down to visit one day. I love cold weather, especially when the sun is out, a great combination. Well Dave, you have to start planning then 🙂 I hope you can visit Fairbanks Alaska soon. It really is a beautiful place. Thanks Erick and glad you enjoyed. The Northern Lights are a site to see for sure. Best place is definitely up north from Anchorage. And yes, lots of nature and out door beauty for sure. Thanks for visiting Beach Travel Destinations. The photos are so beautiful and I imagine it is so peaceful there. I have never head of dog mushing before lol. I had to ask my husband and he said it’s dog sledding…that I have heard of. I cannot imagine being in a place that’s -62 degrees. That is cold! But visiting in the summer sounds great. Thanks for the great post! You are so welcome Chas. And yes, in Alaska it is dog mushing 🙂 Huge Iditarod sled dog race every year. Pretty cool to watch, but yes a bit cold. Thanks for stopping by! Another great piece. I love Alaska. I have done the cruise way and I loved it. I love the beauty and somewhat ‘untouched’ aspect of the natural flow. I have not had the opportunity to do a land-visit but on reading your article, I am going to have to consider it. 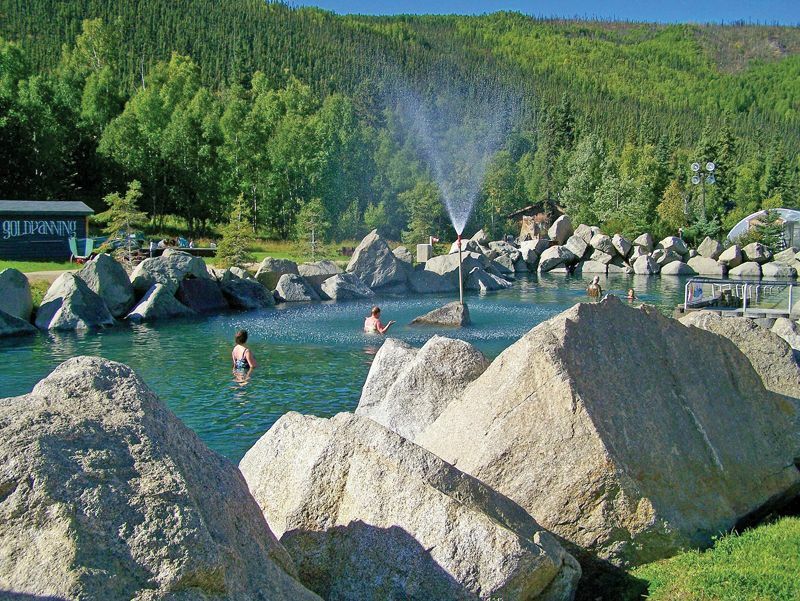 I did not know that Alaska had hot springs…I love this part of Mother Nature’s gifts. And I love the looks of that botanical garden. Yes, I need to do so vacation planning. Thanks for providing me with the ‘resources’. Keep up the good job. Thanks Michelle, I have only done land and air trips in Alaska, but then I lived there for 22 years. I guess that is why I never did the cruise, as I grew up with our family having a boat and a plane. Covered all our bases. You will love a land vacation here, so different for sure. Thanks for stopping by beach travel destinations. 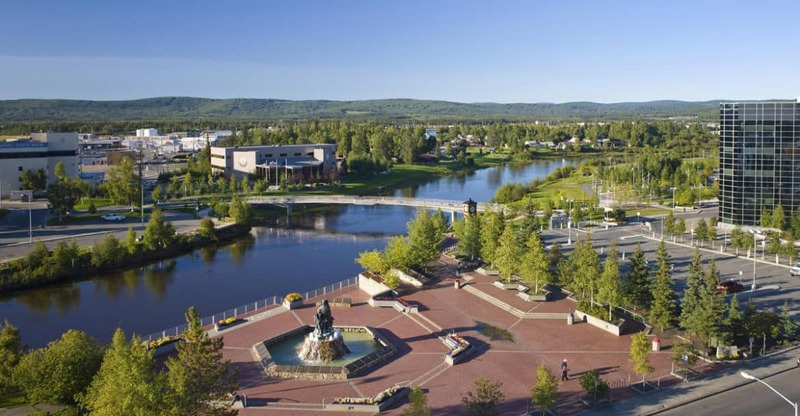 Fairbanks Alaska sounds like a place for a battery-charging vacation. I like your post very much. Even though I am far away, maybe I’ll visit it one day to enjoy that midnight sun. Sounds like magic already! Yes, and it really is the midnight sun LOL. Really the sun never goes down most of the year. Thanks for stopping by and hopefully you can visit Fairbanks Alaska soon. I am glad I have you excited to vacation to beautiful Alaska. You will enjoy your trip! Yes, if you have a rental car, you can easily drive to Fairbanks. It is a very beautiful drive, and you will see tons of wildlife along the way. Please let me know if you have any additional questions, and thanks for visiting beach travel destinations. This look likes a wonderful place to visit! I will keep it on my list while I am putting my alaskan trip together! I cannot wait to take a look at all your other post for more places to visit! Thanks for the post and the information on Fairbanks! You are welcome Katie. Yes, a stop in Fairbanks is a must. If you have a rental car, then it is a piece of cake getting there. Not a super long drive from Anchorage, and so much to see along the way. I hope you can visit Fairbanks Alaska soon! Thanks for stopping by. Sold I do love a hot springs! Something about being toasty warm while everything around is freezing cold just unfolds the best of both worlds. I assume the botanical gardens are a seasonal visit? Yes, the botanical gardens are a seasonal visit for sure. And I do agree, the hot springs are great when it is cold all around. I have done this and it is amazing! Thanks for stopping by to visit Fairbanks Alaska! Fairbanks looks like an awesome place to visit! I’ve never been to Alaska and would love to go. The Tanana River is beautiful. Loved the video with the drone.The Wedgewood Resort is the place I would stay at. Beautiful area with lots to do and the ATV tour would definitely be on my list. Thanks for the heads up on when to go. It’s obviously a summer vacation and it would be a great one at that! Yes, this would be the best in the summer for sure. I am glad you enjoyed and hopefully you can visit Fairbanks Alaska soon! Thanks for stopping by. Reading all your posts about Alaska really makes me want to visit. The Cultural Center sounds awesome! And I’ve always wanted to see the northern lights ever since I saw Balto as a kid. Are there bed and breakfasts available? Yes, the Minnie Street Inn is a great Bed & Breakfast you can stay at. The link is on the post under the hotel section. The northern lights are pretty amazing. You’ll have a great time! Thanks for stopping by to Visit Fairbanks Alaska.